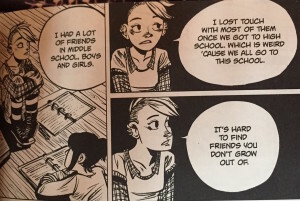 Maggie has a lot of changes in her life: her dad gets a haircut because he’s the chief of police, her twin brother are fighting, her older brother is too busy for her, her mom left, she’s gone from being homeschooled to public school, it’s the first day of HS, and she is haunted by a ghost. Friends With Boys captures the push-pull dynamic of early teenhood. The need to find yourself by pulling away while simultaneously feeling isolated. The difficulty of holding on to friends who are moving in different directions. The challenges of finding yourself without hurting others. For readers who love: Telgemeier’s Drama. When I was a kid, I wanted to be an orphan. I grew up on a heady diet of fantasy books and in fantasy books interesting things always happened to orphans. They turned out to be the scions of long-lost kingdoms. Or to have long-awaited magical powers. Milo is an orphan searching for a connection to his past and a little peace and quiet. At Christmas a handful of strangers show up at his parents’ inn — a mysterious hideaway for pirates and smugglers called the Greenglass House. Each of those strangers carries a secret that ties them to the house and its history. The unfolding of the story through clues and storytelling is wonderful. This book borders on the superlative. I wish I was reading it in the winter because the writing is atmospheric. The slight touch of magic adds a surreal quality to the world that makes me long to visit it. Both Anya’s Ghost and Ms. Marvel deal finding your place in society and fitting in. Anya is an immigrant from Russia who struggles with her embarassment about her chubby, protective, Orthodox mother and her Russian heritage. Kamala, a Pakistani immigrant, feels traps by her overprotective Muslim parents. Anya is haunted by a ghost that wants to help her but may be more than she says she is. Kamala wishes for superpowers, but find the reality of balancing being a superhero with her already challenging circumstances more than she was ready for. I was bullied as a kid for being Russian so both of these graphic novels hit really close to home for me. I recognize the desperation to just blend in with wanting to be something more. I’m not sure I’ve wrapped my head enough around this book to be able to review it. City of Stars is stronger than any of the 2015 Hugo finalists for best novel I’ve finished so far and it is a travesty that this was not on that list. Eventually I will be able to get my head around this book to give it a real review… but for now… if you haven’t read this yet, put down what you’re reading, make a pot of tea, and read this book. This entry was posted in reading and tagged #48hbc, MotherReader 48 Book Challenge 2015. Bookmark the permalink. I loved GREENGLASS HOUSE, too. I want to read it at Christmastime, curled up on a cushy sofa and drinking hot chocolate! Yes! That’s exactly how it should be enjoyed. Wow, am impressive list of books read. Love to see what others are reading. Are you pulling from the Cybils finalists? That’s how I’ve read most of those books. I really liked Greenglass House, and my middle schooler also enjoyed it. Yup. I was pulling the books from various award lists (Cybils, Nebula, Hugo, Locus and Goodreads). We all get stuck in reading ruts here so I thought this weekend would be a great way to try new authors.